Geffis integrates a centralized agenda for the entire rehabilitation centre. Thanks to team vision, the secretary can monitor the commitments of all physiotherapists. A view of the centre agenda without appointments. Colors indicate when staff is in and when equipment is available. Planning doesn’t deal only with physiotherapists’ appointments, but also with the availability of physiotherapists and equipment. This means that, with one glance, the secretary knows who is present, when and how long. 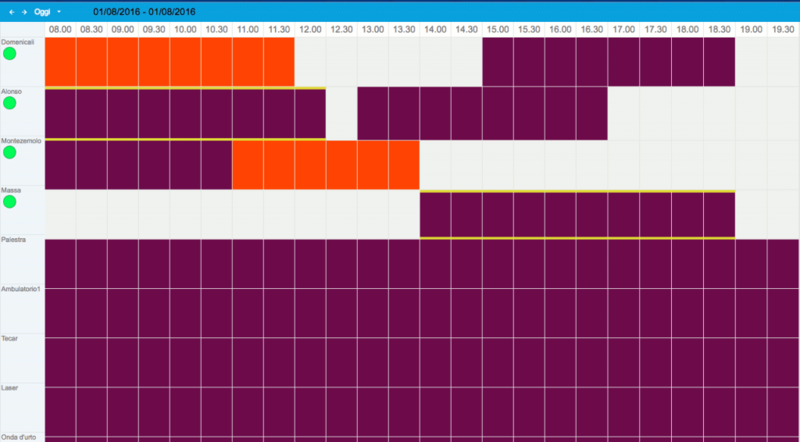 In “availability” you can specify whether a person is going to do physiotherapy (in purple) or handle the office (in orange). The artificial intelligence that we have inserted in Geffis automatically suggests a schedule of appointments, which considers therapies, cadence, patient’s favorite physiotherapist, customer’s preferences in times and days. Multiplanning joins the automatic planning engine, a simple module to visualize different resources group, like physiotherapy room, therapist, equipment (tecar, laser, …). With Geffis you can also manage appointments in several branches, even if the physiotherapists move from a branch to another one.